Eugene John Ruisch, 84, of Le Mars, Iowa passed peacefully, surrounded by his family, away on Wednesday, December 19, 2018 at Floyd Valley Healthcare in Le Mars. Funeral Services will be 10:30 a.m. Monday, December 24, 2018 at Rejoice! Community Church in Le Mars. Pastor Mike Metten and Pastor Kelli Glasgo will officiate. Private family burial will follow at a later date at Resthaven Cemetery, Le Mars. Visitation will begin at 2:00 p.m. on Sunday, December 23 at Rejoice! Community Church with the family present from 5-7 p.m. and a prayer service at 7 p.m. There will also be one hour of visitation at the church on Monday prior to the service. Eugene “Geno” Ruisch was born on September 24, 1934 in Sioux County, Iowa, the son of John and Johanna (Smits) Ruisch. He attended school in Maurice and graduated from Maurice High School. Geno enlisted in the United States Army on August 10, 1955. He served as a clerk until earning his Honorable Discharge on August 9, 1957. He married Adrianna Mae Schiebout on June 4, 1957 at Ireton Christian Reformed Church. They lived many years on a farm near Ireton and moved to Le Mars in 2005. 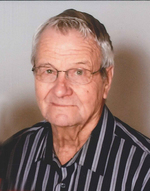 Geno spent two years at Sioux Empire College before transferring to Western Iowa Technical Community College where he graduated in 1974 with a degree in Farm Machinery Mechanics. He then took a position with John Deere Implement in Le Mars. Geno worked with John Deere for the next 42 years, retiring in 2016. Geno and Adri enjoyed years of serving at Calvin Christian Reformed Church, Le Mars. After 40+ years, God led them to Rejoice! Community Church where Geno served faithfully in the Rejoice! Food Ministry, served on the Care Team, and as an elder. His servant heart touched many lives in several missions over the years, including the last 15 summers with Victory Ministries of Alaska. Grateful to have shared his life is his wife of 61 years, Adri (Schiebout) Ruisch of Le Mars, IA; a daughter and her husband, Ronda and Brad Noteboom of Maurice, IA and their children, Rachel (Eric) Van Der Heide, Jonathan (Melissa) Noteboom and Gretchen (Justin) Heronemus; a daughter and her husband, Sharolyn and Randy Christians of Grand Rapids, MI and their children, Josh (Erin) Christians and Matt (Brenda) Christians; a daughter and her husband, Nancy and Michael Van Surksum of Orange City, IA and their children, Ryan (Cady) Van Surksum, Andy Van Surksum, Tyler Van Surksum and Lexi Van Surksum; a daughter and her husband, Lisa and Jim Kuiper of Downers Grove, IL and their children, Brian Kuiper, Jason (Grace) Kuiper, Daniel Kuiper and Amy Kuiper; a son and his wife, Joel and Dara Ruisch of Pella, IA and their children, Jaime (Peter) Burr, Ally (Kea) Nacolatabua and Brandon Ruisch; 14 great-grandchildren with another on the way; a sister, Berdena Grady of Orange City, IA; a sister-in-law, Wilma Ruisch of Burnsville, MN; and numerous sisters-in-law; brothers-in-law; nieces and nephews. He was preceded in death by his parents; a brother, Howard; a brother and his wife, Willus and Christina; and brothers-in-law, Bernard Grady and Bill Bleeker. Memorials in Geno’s name may be directed to Rejoice! Community Church Food Ministry or Victory Ministries of Alaska, 64741 S. Victory Road, Sutton, Alaska 99674. This obituary is protected by copyright by Mauer - Johnson Funeral Home. Proudly Serving the Communities of Le Mars, Kingsley, Marcus, Merrill, Hinton, Struble, Craig, Brunsville, Akron, Oyens, Seney, Remsen, Meriden, Cleghorn, Cherokee, Pierson, Correctionville, Grand Meadow, Washta, and Moville. Mauer - Johnson Funeral Home is located in the state of Iowa, United States.